U. plumipes is probably imported from Holland on pot plants and is able to survive in greenhouses where the winter temperature is maintained well above freezing. In this habitat it appears to be playing an effective role in controlling whitefly. 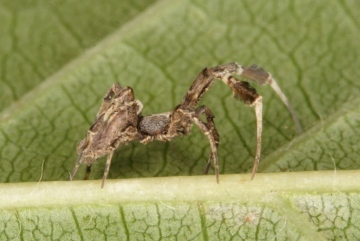 At rest the spider resembles a small piece of dried vegetation. It spins a small horizontal, cribellate web up to 30 cm across (although this may be smaller if space is restricted) resembling that of U. walckenaerius. It may be seen, for example, spun across the tops of plant pots. The egg-sacs, varying from dark brown to pale cream in colour, are characteristically star-shaped and have been seen suspended from a mass of greyish cribellate silk. They are often the easiest way of confirming its presence. Information on the seasonal activity of the species is not available. Easily distinguished from Uloborus walckenaerius, the only other member of the cribellate family Uloboridae found in Britain, by the feathery hairs on tibia 1. Not formally included on the British checklist although recorded in England in the early 1990s in three widely separated localities - Liverpool, Southampton and Reading. The species is now extremely common in greenhouses in the Reading area (Hopkin 2000) and is increasingly being recorded further afield. The spider has been found in every garden centre searched in Cambridgeshire, Huntingdonshire, Bedfordshire, Suffolk, Hertfordshire and Kent (I. Dawson, pers. comm.) and it has recently been found in a Leicester garden centre where it was fairly common within several of their heated glass houses (J. Daws, pers. comm. ).